Pyrroloquinoline quinone was discovered in 1964 as the third redox cofactor after nicotinamide and flavin in bacteria. Enzymes containing PQQ are called quinoproteins. Dopamine beta-hydroxylase (Dopamine beta-monooxygenase, P09172 in Uniprot, DOPO_HUMAN). 3,4-dihydroxyphenethylamine + ascorbate + O2 = noradrenaline + dehydroascorbate + H2O. Binds 1 PQQ per subunit. This review highlights some recent findings regarding nutritional and endocrine regulators of mitochondrial mass and function and their association with insulin resistance. Insulin resistance is central to many chronic metabolic diseases, including obesity, type 2 diabetes, dyslipidemia, and hypertension. Insulin resistance in skeletal muscle is associated with lower mitochondrial mass and reduced oxidative phosphorylation. Part of the mitochondrial dysfunction can be triggered by adverse nutrition. Increased fatty acid exposure, resulting from high fats diets or overfeeding, is linked to both decreased mitochondrial number and markers of oxidative phosphorylation. Caloric restriction and the adiponectin signaling pathway, however, can stimulate mitochondrial biogenesis by elevating the transcriptional machinery that regulates mitochondrial mass, improving mitochondrial efficiency, activating the peroxisome proliferator-activated receptor coactivator 1alpha mediated reactive oxygen species scavenging mechanism, and lowering reactive oxygen species production. States of insulin resistance are characterized by defects in lipid and carbohydrate metabolism. Abnormalities in oxidative capacity, however, can be partially normalized by caloric restriction by modulating mitochondrial mass in an insulin sensitizing manner. Growth, reproductive performance, and indices of collagen maturation and expression were investigated in Balb/c mice fed chemically defined, amino acid-based diets with or without the addition 6 micro Mpyrroloquinoline quinone (PQQ)/kg diet. The diets were fed to virgin mice for 8 weeks before breeding. At weaning, the pups from successful pregnancies were fed the same diet as their respective dams. Reproductive performance was compromised in mice fed diets devoid of PQQ, and their offspring grew at slower rates than offspring from mice fed diets supplemented with PQQ. Successful mating (confirmed vaginal plugs) was not affected by the presence or absence of PQQ; however, pup viability (number of pups at parturition/number of pups at Day 4 of lactation) was decreased in PQQ-deprived mice. Conception (percentage of females giving live births) and fertility (percentage of births) were also decreased in PQQ-deprived mice. The slower rates of growth in offspring from PQQ-deprived mice were associated with decreased steady-state mRNA levels for Type I procollagen alpha(1)-chains in skin and lungs from neonatal mice. Values for lysyl oxidase accumulation as protein in PQQ-deficient mice also tended to be lower than corresponding values from PQQ-supplemented or -replete mice. Skin collagen solubility was increased in PQQ-deprived mice. These results indicate that PQQ supplementation can improve reproductive performance, growth, and may modulate indices of neonatal extracellular matrix production and maturation in mice fed chemically defined, but otherwise nutritionally complete diets. The metabolism and functions of PQQ and ascorbate may be coupled. Pyrroloquinoline quinone (PQQ) was first identified in methylotrophic bacteria as a coenzyme for methanol dehydrogenase in 1979, and named as methoxantin. PQQ covalently interacts with different enzymes and the protein interacting with PQQ were originally termed as quinoproteins. In general, ortho-quinone cofactors are involved in various biological reactions that range from oxidative deaminations to free-radical redox reactions. PQQ was the first cofactor to be found in this cofactor-family, followed by the identification of tryptophan tryptophylquinone (TTQ), trihydroxyphenylalanyl quinone (topaquinone or TPQ), lysine tyrosylquinone (LTQ) and the copper-complexed cysteinyltyrosyl radical. Although no enzymes in animals have been identified that exclusively utilize PQQ, oral supplementation of PQQ in nanomolar amounts increases the responsiveness of B- and T-cells to mitogens and improves neurologic function and reproductive outcome in rodents . It has been shown to be essential for normal growth and development in animals but its suggested role as a vitamin in mammals has to be determined. roles in the growth and development of all organismsstudied so far, its synthesis in higher organisms has not been shown. The major source of PQQ in these organisms is believed to be microbial sources. PQQ is a potent neuroprotective nutrient against 6-hydroxydopamine-induced neurotoxicity, methyl mercury-induced neurotoxicity, N-methyl-D-aspartate (NMDA) receptor neurotoxicity, and aggregated b-amyloid-induced toxicity, a critical cause in thr pathogenesis of Alzheimer’s deseese. PQQ also has been reported to promote synthesis of nerve growth factor (NGF) in human fibroblasts. In addition, in rats and mice, PQQ appears to improve indices of perinatal development, possibly through increased mitochondrial content. PQQ also has been associated with preservation of mitochondrial function, through reduction of free radicals and oxidative stress. In light of its beneficial physiological effects, PQQ has been identified as a potential candidate for use in dietary supplements or food products for human consumption. This may be due to confusion as to whether solely PQQ should be counted or PQQ conjugates. It should be noted that due to an affinity of PQQ to bind to amino acids and form imidazolopyrroloquinoline derivatives that the PQQ content of foods may not be the same as the total bioactive amounts of PQQ, probably due to rapid association with proteins . Human milk, for example, contained 15% PQQ and 85% IPQ derivatives. It is not known if this potential interaction with dietary protein is beneficial or negatively influences bioavailability. Dietary supplements containing PQQ disodium salt (BioPQQ™) are currently commercially available in the United States (US) for use by healthy adults at a maximum serving level of 50 mg/day to maintain cognitive function, mitochondrial biogenesis, and to provide antioxidant activity. PQQ disodium salt is currently authorized in Canada as a Natural Health Product, providing 20 mg PQQ disodium salt/day as an antioxidant for the maintenance of good health. Pyrroloquinline quinone (PQQ) is a quinone structure with three carboxylic acid groups and two ketone groups . The two ketone groups are involved in the REDOX capacities of the molecule: it is thought to be a relatively stable REDOX factor in vivo, and is able to carry generally around 20,000 REDOX reactions before degradation, and when it carries out REDOX reactions by itself it gets converted into its reduced form known as pyrroloquinoline dihydroquinone(PQQH2) and is replenished (back to the PQQ form) by glutathione. Pyrroloquinoline quinone is heat-stable and water soluble . The biosynthesis pathway of Pyrroloquinoline quinone is largely unknown, but it is proven that at least six genes in Klebsiella pneumoniae (PqqA-F) are required, all of which are located in the PQQ-operon. Except for PQQ, quinone cofactors are linked to the polypeptide chain and derived post-translationally from Tyrosine (Tyr) and Tryptophan (Trp) residues encoded within their parental polypeptide chain. PQQ is distinct from the other quinone synthetic groups in that it is biosynthesized independent of its site of action. Figure 1. Chemical structure of PQQ. Chemical structure of PQQ (4,5-dihydro-4,5-dioxo-1Hpyrrolo[2,3-f]quinoline-2,7,9-tricarboxylic acid) with atom nomenclature. All carbon and nitrogen atoms of PQQ are derived from conserved tyrosine and glutamate residues of the PqqA peptide. R1 and R3 represent the N- and C-terminal portions of PqqA, respectively. R2 represent a three-amino-acid linker between Glu and Tyr. Klebsiella pneumoniae needs six genes, seven genes are required in Methylobacterium extorquens, whereas Acinetobacter calcoaceticus requires only four genes for PQQ synthesis. Due to the fact that Tyr and Glu are part of the peptide precursor PqqA the question arises how these two residues are cut out of the peptide and linked. C-C bond formation at atoms C9 and C9a (Figure 2, step 1) is most probably one of the first reaction steps in order to link the two amino acids before the peptide bonds are cut. A likely candidate for catalyzing this reaction is PqqE, because it is the only enzyme in the pathway with significant sequence similarity to radical SAM proteins capable of catalysing C-C bond formation. After this reaction the now covalently linked amino acids Glu and Tyr are still linked to the PqqA-peptide backbone. Since PqqF is the only member with significant sequence similarity to proteases, it is most probably responsible for cleaving the four peptide bonds at R1 and R2 of Glu and R2 and R3 of Tyr (Figure 2, step 2). After the linkage and proteolytic cleavage of the four peptide bonds the amino group N6 of Glu and the OH (C5a) of Tyr are primed to spontaneously form a Schiff-base reaction (Figure 2, step 3). As a next possible reaction step two OH- groups are added to atoms C4 and C5 in the Tyrosine ring which requires most likely a dioxygenase (Figure 2, step 4). Yet, there is no protein with apparent sequence similarity to a dioxygenase in the PQQ operon. Candidates could be PqqB and PqqD, which however do not feature oxygenase similarities, or another oxygenase from the bacterium not exclusively used for PQQ-biosynthesis. 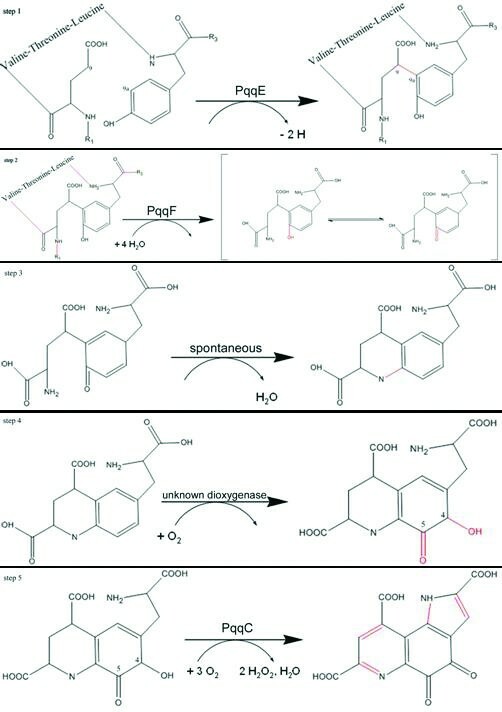 The final step in the reaction has been elucidated and is catalyzed by PqqC . The multi-step reaction includes a ring closure at N1 and the removal of eight electrons and eight protons from the intermediate to form PQQ (Figure 2, step 5). Although mammalian synthesis is not certain, PQQ does occur normally in the mammalian body and approxiamtely 100-400 nanograms of PQQ are thought to be made in humans each day, leading some authors to claim an estimated tissue concentration of approximately 0.8−5.9ng/g in humans. Recently, a body of evidence showed that PQQ plays an important role in the central and peripheral nervous system. For example, PQQ protects the brain from reversible middle cerebral artery occlusion , inhibits 6-hydroxydopamine-induced neurotoxicity , attenuates the gene expression of inducible nitric oxide synthase in the injured spinal cord , increases the level of nerve growth factor in astroglial cells, and promotes the regeneration of rat sciatic nerve. Excessive production of reactive oxygen species (ROS) is considered to be involved in brain injuries and some neurodegenerative diseases. The strong ability of PQQ to scavenge ROS and attenuate oxidative stress in mitochondria may contribute to its protective effects on the nervous system. PQQ has been found to modulate N-methyl-D-aspar­tate (NMDA) receptor by directly oxidizing its redox modulatory site and to inhibit glutamate-induced ROS production in cultured cortical neurons. Recent research demonstrated that PQQ can rescue primary hippocampal neurons from glutamate injury through inhibition of ROS production and activation of the phospha­tidylinositol-3-kinase (PI3K)/Akt pathway . However, the downstream pathways and the details of molecular mechanisms involved have not been fully elucidated. In a study performed on 2012 in China, had been investigated the downstream pathways of PI3K/Akt involved in PQQ protection of glutamate-injured hippocampal neurons to further elucidate the molecu­lar mechanisms underlying the neuroprotective effects of PQQ. PQQ actives the phosphorylation of Akt/GSK3β pathway. PQQ displays a strong anti-apoptotic activity in cortical neurons and actives multiple cell survival pathways that are essential to cell growth, survival and differentiation, such as Ras/ERK and PI3K/Akt signaling. As is known, the down-regulation of GSK3β activity is one of the mechanisms involved in cell survival, promoting the function of PI3K/Akt signal­ing pathway. Contrary to most signaling kinases, GSK3β is active in unstimulated cells and makes cells sensitive to insults. The activation of signaling kinases such as Akt, extracellular regulated protein kinases (ERK), and protein kinase C (PKC), may phos­phorylate GSK3β at Ser9, leading to its inactivation. Treatment with 50 or 100 μM PQQ for 30 min can significantly increase the phosphorylated Akt level in glutamate-injured hippocampal neurons. As indicated by Western blot analysis (FIGURE 3A and B), glutamate stimulation induces a short-term (5 min) activation of Akt, implying that some internal processes of protecting cells from death may be switched on. However, this activation of Akt by glutamate is instant and the activated signal is not enough for the cells to survive the injury. In contrast, PQQ treatment can lead to a sustained (more than 2 h) phosphorylation of Akt, which may provide essential conditions to antagonize glutamate-induced cell apoptosis. 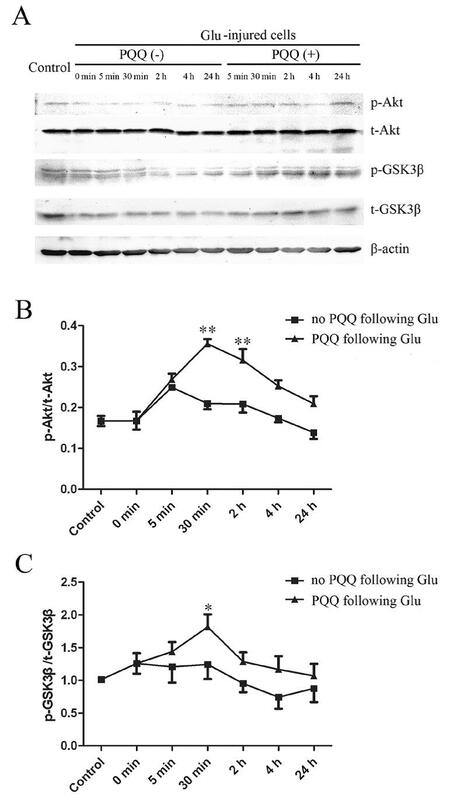 Meanwhile, GSK3β, one of the mayor downstream targets of Akt pathway, is phosphorylated by PQQ with a peak at 30 min (FIGURE 3A and C), suggesting that GSK3β may be one of the downstream signaling molecules of Akt in the experimental setting. Figure 3. Phyrroloquinoline quinone (PQQ) influence the phosphorylation of Akt and GSK3β in glutamate (Glu)- injured hippocampal neurons. The ratios of phospho-Akt (p-Akt) to total-Akt (t-Akt) (B) and phospho-GSK3β (p-GSK3β) to total-GSK3β (t-GSK3β) (C) are detected when Glu (125 μM)-stimulated (for 15 min) hippocampal neurons receive or don’t receive PQQ (100 μM) treatment for different times (0, 5, and 30 min, 2, 4, and 24 h), respectively. Primary cultured hippocampal neurons receiving only vehicle treatment serves as control. *P < 0.05 and **P < 0.01 versus receiving no PQQ treatment at the same time. A is the representative Western blot images, in which β-actin served as an internal control. PQQ promotes the translocation of Nrf2 to nucleus dependent on activation of PI3K/Akt pathway . GSK3β plays an important role in the nuclear exclusion and inactivation of the tran­scription factor Nrf2, resulting in the sensitization of neurons to oxidative damage. Functional interference between GSK3β and Nrf2 protects hippocampal neurons against kainate-induced cell death. Under basal conditions, Nrf2 binds tightly to the regulatory protein Kelch-like ECH-associated protein 1 (Keap1) and retains it in the cytoplasm. The phosphorylation of Nrf2 at Ser40 by PKC causes the dissociation of Nrf2 from Keap1 and subsequent translocation to the nucleus. After translocation, Nrf2 activates a battery of ARE-driven genes in the nucleus, including direct antioxidant en­zymes (such as catalase, superoxide dismutase and GSH) and indirect antioxidant enzymes (such as phase II detoxifying enzymes, GSH generation enzymes and stress response proteins), and several specific chemicals exhibit antioxidant, ROS-eliminating properties through Nrf2 signaling. PQQ treatment promotes the translocation of Nrf2 from the cytoplasm to nucleus in glutamate-injured hippocampal neurons, and the application of PI3K inhibitors blocks this nuclear translocation. These data sug­gest that Nrf2 translocation may covering an important role in the cell survival promoted by PQQ and that PI3K/Akt/GSK3β is required for this process. PQQ alters the mRNA expressions of Nrf2, HO-1 and GCLC. The qPCR data show the changes in mRNA expressions of Nrf1, Nrf2, HO-1, and GCLC. Different cell treatments don’t significantly alter the mRNA expression of Nrf1 in cultured hippocampal neurons (Figure 4A). In contrast, the mRNA expression of Nrf2 in cul­tured hippocampal neurons is significantly decreased by glutamate stimulation, and then is significantly increased by PQQ treatment in a dose-dependent manner (Figure 4B). Either of the PI3K inhibitors, LY294002 or wortmannin, attenuate the PQQ-induced up-regulation of Nrf2 mRNA in glutamate-injured hippocampal neurons (Figure 4B). Likewise, the mRNA expression of HO-1 and GCLC, two target genes of Nrf2, in glutamate-injured hippocampal neurons are also up-regulated by PQQ treatment, and then attenuated by concomitant use of PI3K inhibitor, LY294002 or wortmannin. These qPCR data suggest that the up-regulation of Nrf2 may be responsible for the neuroprotec­tive action of PQQ and that such up-regulation is also dependent on the activation of PI3K/ Akt signal pathway. Figure 4. mRNA expressions of transcription factors and enzymes affected by phyrroloquinoline quinone (PQQ) treatment dependent of PI3K/Akt pathway. 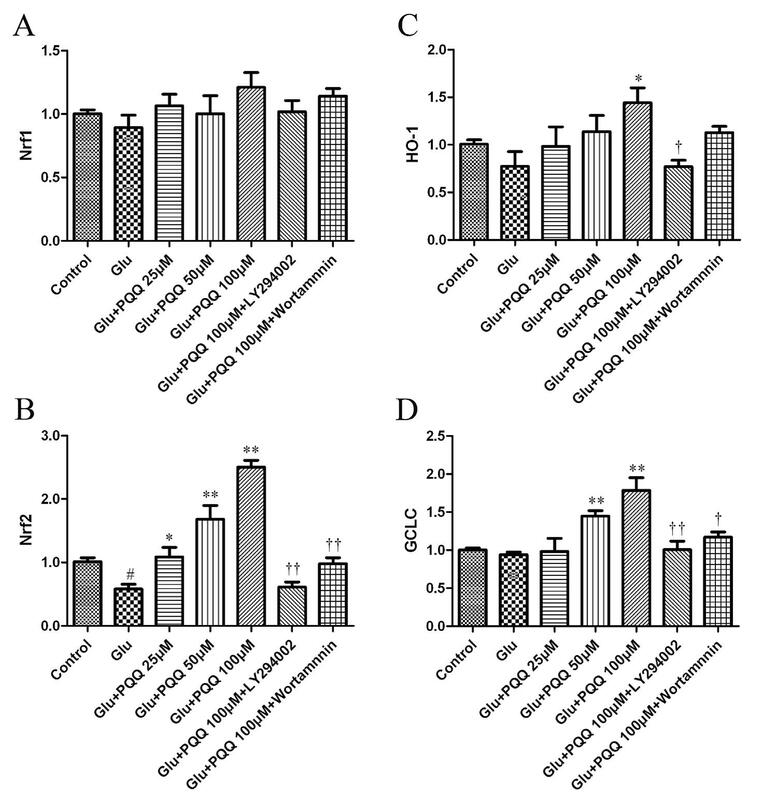 The qPCR data of the mRNA of Nrf1 (A), Nrf2 (B), HO-1 (C), and GCLC (D) in cultured hippocampal neurons stimulated by 125 μM glutamate (Glu) for 15 min and then treated with PQQ (25, 50 and 100 μM) for 30 min with or without PI3K inhibitors LY294002 (10 μM) and wortmannin (100 nM), respectively. *P < 0.05 and **P < 0.01 versus Glu (125 μM) stimulation alone, #P < 0.01 versus control, †P < 0.05 and ††P < 0.01 versus Glu (125 μM) + PQQ (100 μM). In summary, PQQ can protect primary cultured hippocampal neurons against glutamate-induced cell damage through the activation of Nrf2 and subsequent up-regulation of antioxidant enzyme genes including HO-1 and GCLC, which are dependent on the PI3K/Akt/GSK3β pathway. Moreover, the ability of PQQ to scavenge ROS is not totally regulated by PI3K/Akt signaling, and thus, some other mechanisms may be involved. This is thought to underlie some of the protective benefits of PQQ on cellular structure seen in vitro. In a study performed on 2013 had been investigated the possible protective effects of pyrroloquinoline quinone (PQQ) on the rat cortex with glutamate injection and to understand the mechanisms linking the in vivo neuroprotection of PQQ. The result is that Co-treatment with PQQ protect neural cells in the rat cortex from glutamate-induced apoptosis and that PQQ-induced activation of Akt/GSK3β signal pathway may be responsible for the in vivo neuroprotection of PQQ.